New Eagle specializes in mechatronic controls, which are the electronic brains that drive mechanical systems. Some companies ask us to design and build their control systems and custom applications from start to finish, while others turn to us for expert advice and support. Our crew of engineers provides the specialized engineering services your team needs to solve difficult mechatronic control challenges, while our Raptor software tools and supply chain offerings provide you with the resources you need to create a reliable control system for your machine, fast. Our process begins with a great team of people. 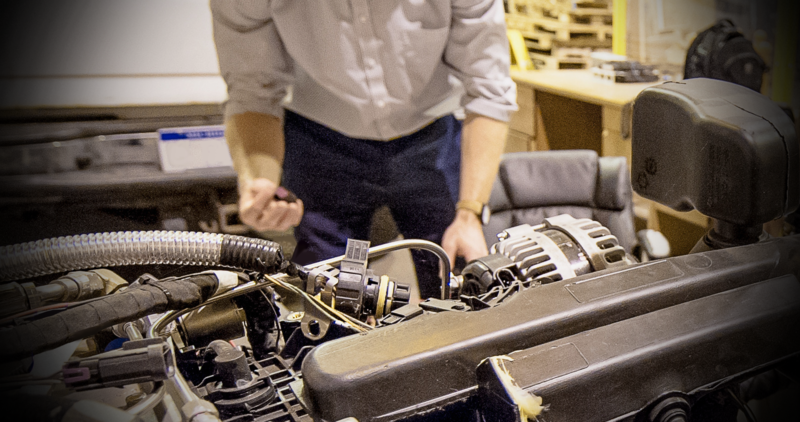 Our team works with you to understand your specific needs, then provides expert advice to help you move forward with creating and integrating a control system for your machine. Next, our Raptor platform tools let you quickly create powerful control software in an intuitive, embedded model-based development (eMBD) environment. Our tools cut out inefficiencies, like having to rewrite software algorithms for each embedded device you add or exchange in your machine. We serve as your supply chain partner by providing you with the production-ready hardware you need to sustain your machine’s development from prototype through production. Our hardware offerings cleanly integrates with the control software you build with our Raptor tools for a faster, easier control-development process. Our team is happy to provide you with the support you need to transform your idea into an innovation. We offer a variety of resources and services, from onsite training to an in-depth online knowledge base. We’re committed to helping you take control, and will be as hands-on (or hands-off) as you’d like. New Eagle is headquartered just minutes from the heart of downtown Ann Arbor, Michigan. 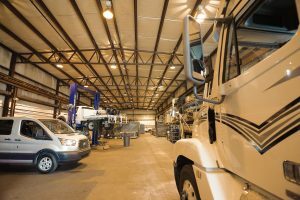 The Ann Arbor campus features a fully-equipped prototype garage, software lab, distribution center and an open-floorplan office space that fosters a collaborative work environment. In addition to its Ann Arbor headquarters, New Eagle also has office space locations in Indianapolis (pictured) and Lake Forest, California. 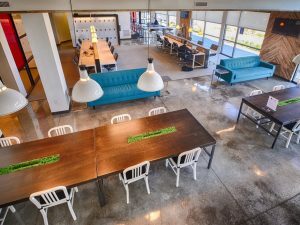 Our workspace combines the agility of a startup with the resources and opportunities of a well-established company. This plays out in the interesting work we do, the great global customers we work with and the fun we have as a team. New Eagle is committed to forming a better world. Each year, our team dedicates over 1,000 volunteer hours to the local community. 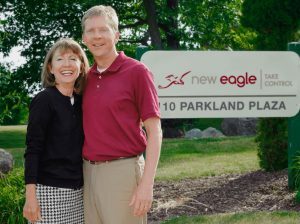 As a company, New Eagle supports both local charities and global environmental protection efforts. 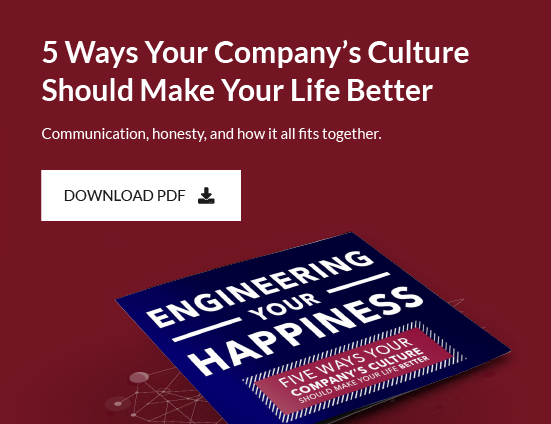 We believe that positivity promotes productivity and that the best careers are the ones that grow with you. We are dedicated to our foundational values of teamwork, passion, excellence, charity, and integrity. 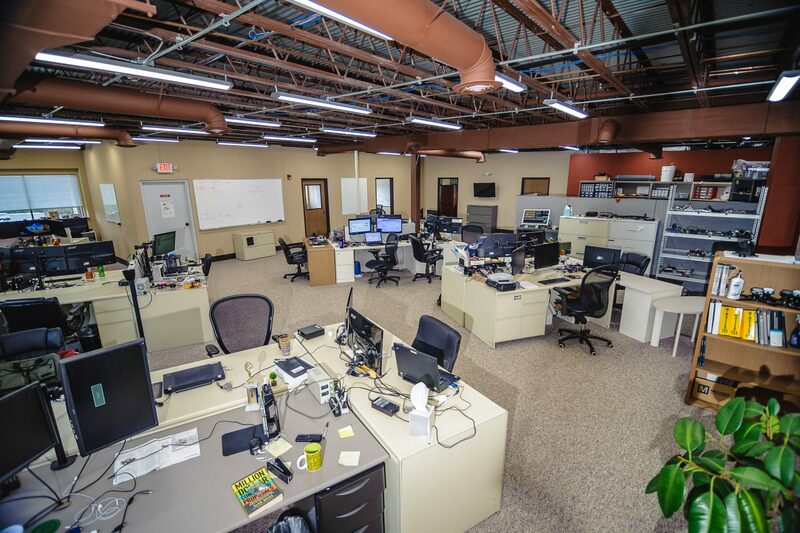 These values guide the work that we do and help remain focused on our mission of helping clients take control of their project with our custom control systems and experienced engineering services. New Eagle is a proud supporter of Father Gabriel Richard High School‘s extracurricular FIRST Robotics team, the Byting Irish. 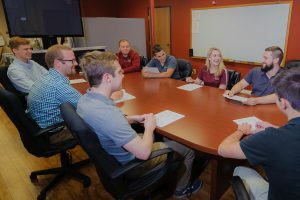 By providing mentorship, financial sponsorship, and facilities for the team’s meetings, New Eagle is inspiring future innovators to take an active role in growing STEM fields. New Eagle is also a supporter of the DTE Energy Foundation Trail, an organization constructing a five loop, 20 mile mountain bike trail system in Waterloo Recreation Area to benefit the community.